Acclaimed both as a conductor and violinist, Joseph Swensen combines his considerable talents in this, his first collaboration with the Scottish Chamber Orchestra. Originally released in 2004, �Mendelssohn: Violin Concerto No.2� has been re-issued as part of Linn�s Echo series which offers a second chance to enjoy the best of the label�s award-winning catalogue. This exceptionally beautiful recording of some of Mendelssohn's loveliest music showcases Swensen�s skills as a virtuoso violinist with playing of unusual grace. The Hebrides, widely known as Fingal's Cave, is one of Mendelssohn's most popular works - its programmatic depiction of the Scottish sea cave has captured the imagination of listeners for many years. The Violin Concerto marks Mendelssohn�s last large orchestral work. Considered an essential work for all aspiring concert violinists to master, it remains one of the most frequently performed concertos. 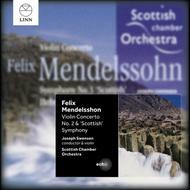 Many regard the �Scottish� Symphony as Mendelssohn�s best orchestral work - once again taking inspiration from Scotland (this time Holyrood Chapel), the symphony contains one of Mendelssohn�s finest scherzos. Joseph Swensen was principal conductor of the Scottish Chamber Orchestra from 1996-2005, at which point he became the orchestra�s Conductor Emeritus.